Milwaukee Bicycle Co. is making a chain ring and bash guard all in one integrated piece. Just one BCD and tooth size right now*. I’m not sure if it will work nicely with cranksets that are not the Sugino XD. Seems to me like they might. And there is no listed price. But here’s what they look like. I think it could will does look good on my polo bike! Thanks Drew!! All in one guard and chainring. No more bent chainrings! In production. - Designed solely for the Sugino XD 110bcd cranks – One of the reasons why we chose those cranks is availability; unlike other smaller closet manufacturers these cranks will always be available. But probably the foremost reason… not only does the compact 110bcd XD spider make for a stronger system than a 130bcd or larger bcd, but the “offset” XD spider is perfect because it puts one spider arm right behind and part of the actual crankarm, so there is one less spider arm to get hit by a mallet. - The 35 tooth ring – by making the smallest ring possible it adds to the strength. We wanted to fit ratios that allowed a polo player to ride to a match with a small cog on one side of the wheel and flip it to the polo gear on the other side of the wheel when they got to the match. - The five pockets in the guard make it possible to rotate the guard if for some reason a certain section gets damaged. Although we don’ see that happening, but one never knows. This guard measures 14mm at its thickest point. 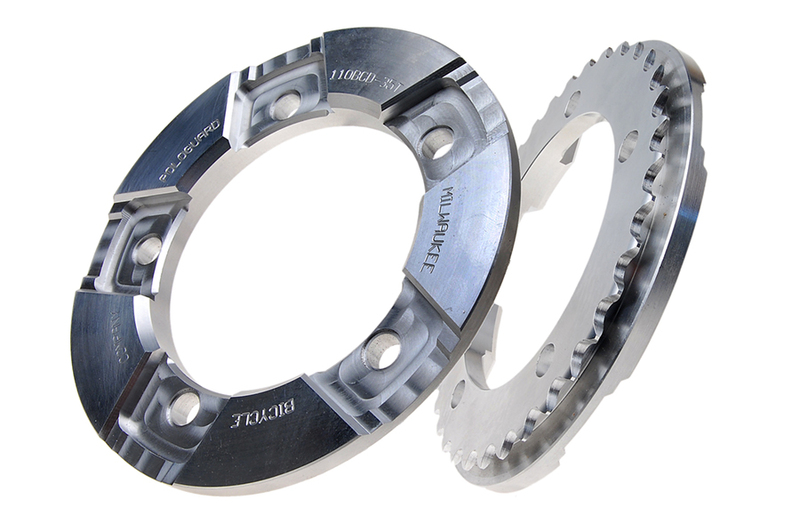 - CNC’d out of 7075 T6 Aluminum – one of the most durable alloys available and the choice of material for many professional track racing chainrings. So you should get miles and miles and miles of use. 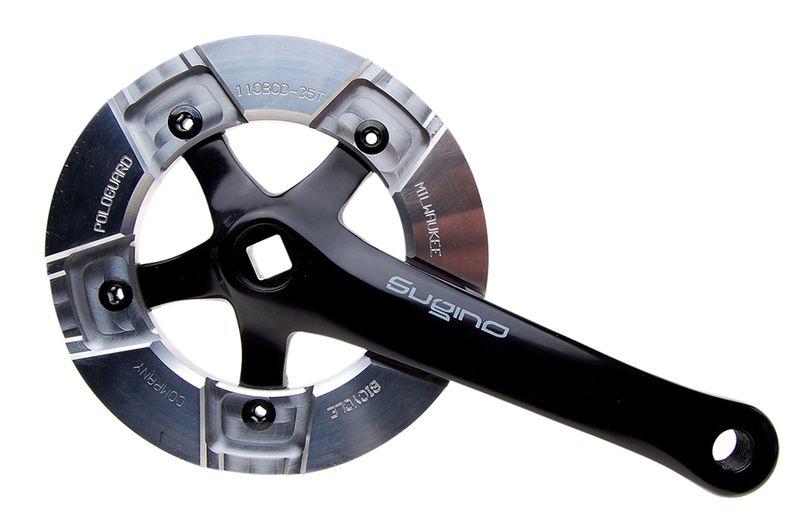 - Price point – Sugino XD’s in 165 or 170mm / Silver or Black arms and the Polo Guard as a crankset for $125. This entry was posted by Doug D on July 30, 2008 at 12:01 am, and is filled under Bike Polo, Products, Wisconsin. Follow any responses to this post through RSS 2.0. You can leave a response or trackback from your own site. what, and never get chainring scars on my legs again? whats the fun in that? I shot Drew from Milwaukee an email. You two should talk man! Oh hell yes. Sign me up. Ben, that’s awesome! do they like them? I had a phone conversation with Drew at Milwaukee Bicycle Co. today, and he’s sending me a set up to test out. I can’t wait! I might have it before this weekends tournament!! this is something i (my legs) would definitely be interested in… whether it fits the Ocean Liner or not is another story. I run the race face “I Beam” crankset with the race face bash guard. Looks similar to this set up. I cut my leg down to the tendon playing polo a year ago so i got the bash guard. I got a nice long scar now! That one looks plenty wide to keep your leg from getting diced. how the frig is doug getting sent a set when i havent gotten my sponsored set yet?